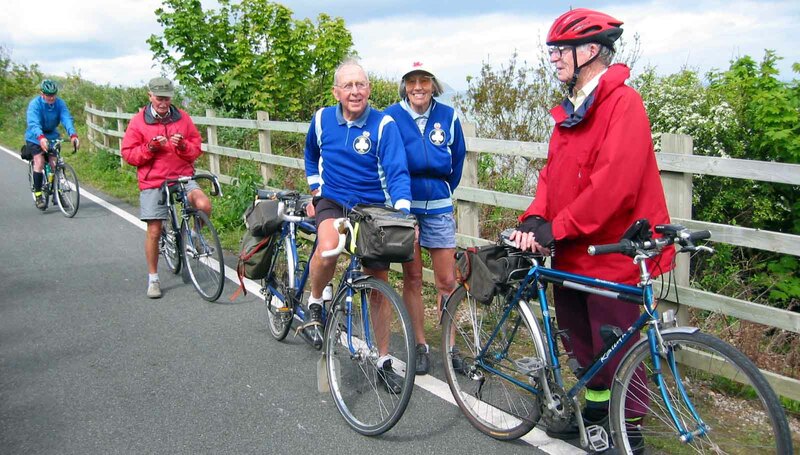 WW2 hero who found retirement joy in cycling – and France’s prestigious honour. 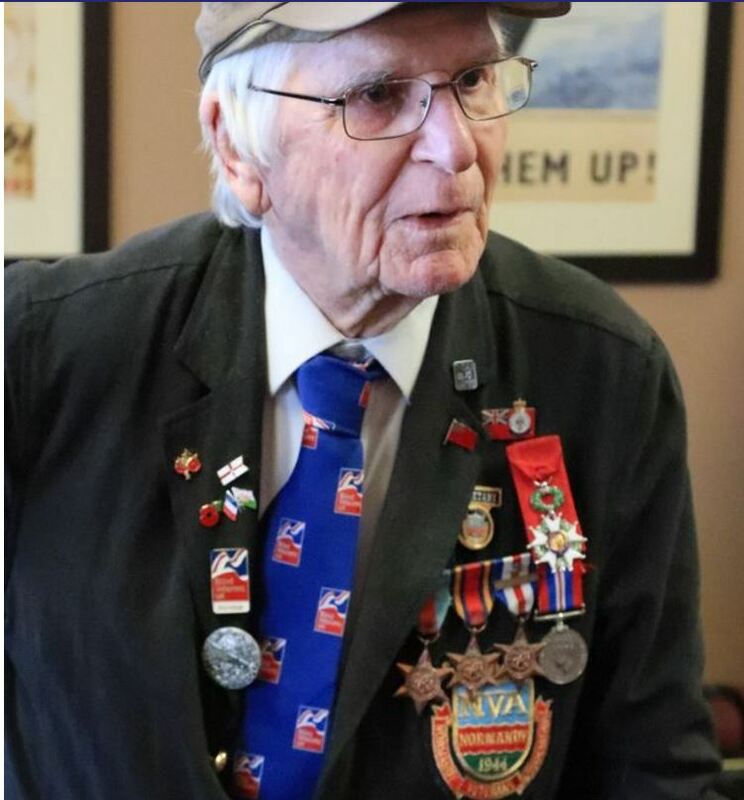 A blind World War II veteran has been presented with a prestigious honour for his part in the liberation of France. On July 3, 1944 at 7am, the Samholt anchored off Juno Beach. Brian recalls the constant danger that his and so many other anchored ships were in during the campaign, due in large part to the scale of the damage being inflicted by the Germans. He said: “For the ships anchored off the assault beaches, it was a position of extreme vulnerability, particularly at night-time when E-boats and Marder attacks were common. “The Marder in particular was one-man electrically propelled German submarine carrying one torpedo. It had a range of 48 miles and a loaded speed of three knots. I remember on July 8, they sunk the minesweeper Pylades eight miles north of Oustreham, as well as torpedoing the Polish cruiser, Dragon off Sword Beach. In mid-September, Samholt was withdrawn from Normandy, with Brian and his crew travelling to New York via Southend, and later Hartlepool. From here, he sailed to Port Said, Egypt for December, before spending Christmas Day in Madras, India. Following tours to Cape Town and various countries in South America, Brian eventually returned home in May 1945. Legion d’Honneur, – France’s highest order. 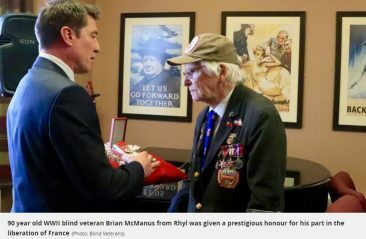 It was not until 2014, on the 70th anniversary of the Invasion of Normandy, that Brian learned he may be eligible for the Legion d’Honneur, – France’s highest order. 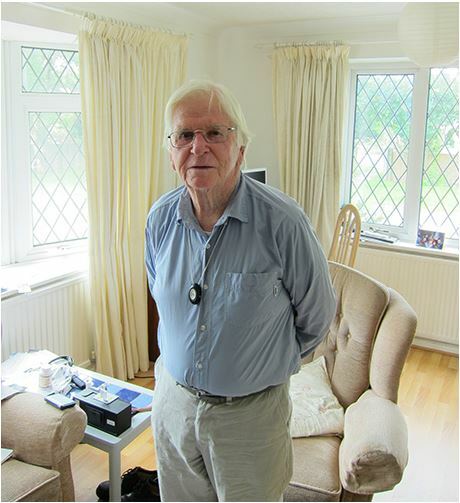 Despite the sheer amount time that has elapsed since the war, Brian is able to look back with clarity on those everyday occurrences that characterised his time in service. He recalled: “There were special articles of agreement for merchant navy. 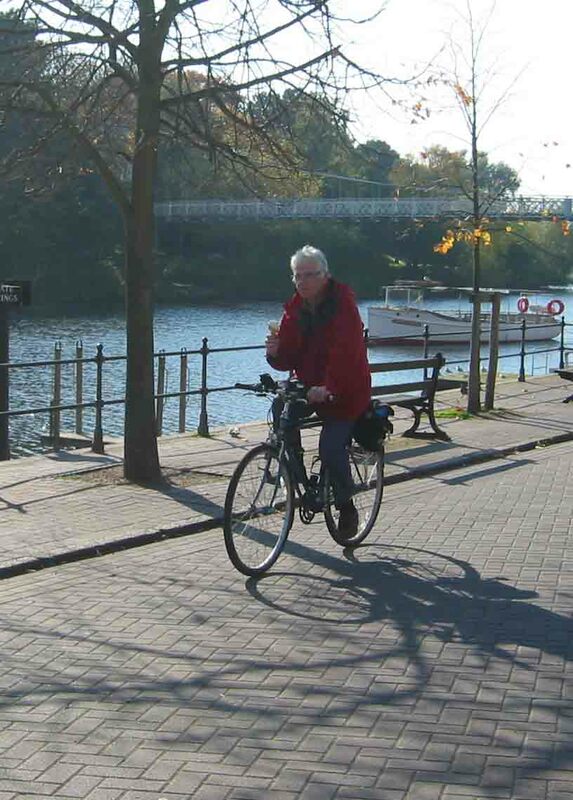 Brian, who suffers from age related macular degeneration and glaucoma, counts the backing he’s received from Blind Veterans UK as crucial to his being able to regain independence following sight loss. Blind Veterans UK was founded in 1915 and the charity’s initial purpose was to help and support soldiers blinded in the First World War. 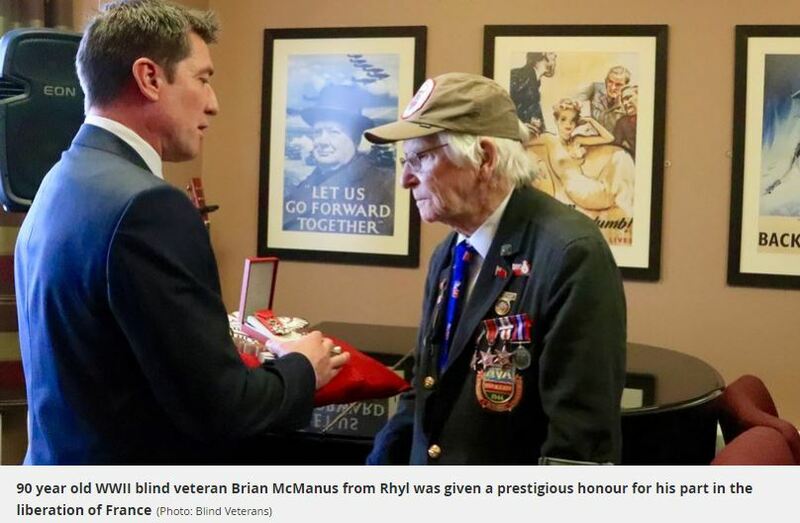 But the organisation has gone on to support more than 35,000 blind veterans and their families, spanning the Second World War to recent conflicts including Iraq and Afghanistan. In his years of retirement there was nothing Brian enjoyed more than pootling around on his bike before his deteriorating vision made this impracticable. 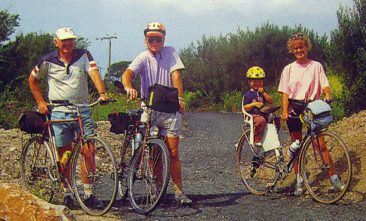 As a CTC member he relished the company of other cyclists.The writer recalls with great fondness our all-weather, all-season, evenings meetings on the promenade between Kinmel Bay where he lives, and Prestatyn where I lived. We were not discouraged by the prevailing conditions. Many are the high-tide storms we encountered in the pitch dark! I recall telling him of another retired ship’s captain, Richard, of whom I was acquainted and also a CTC member. Brian was Merchant Navy, Richard Royal Navy. Came the occasion they met for the first time. I left them to talk, presuming of their adventures on the high seas. A few minutes later I listened in. Not a bit of it. They were discussing the relative merits of derailleur gears! Such are the friends you meet a’wheel. In more recent times Brian was approached by Liverpool’s John Moore’s University to be interviewed for a seagoing audio documentary. Thanks to Roger Warren of Manchester for drawing our attention to an article in Nautilus ‘Telegraph’ magazine of May 2018 entitled ‘Living Links to Liverpool Legends’ backed by The Heritage Lottery fund and carried out by Jim White and colleagues of LJMU and entitled ‘Homeward Bound’. Brian was located as a living legend and his life at sea re-visited. Well worth a watch, and not just the interview with Brian and its associated transcript .